This extension for Firefox locates any sitemap provided for the site you are visiting. 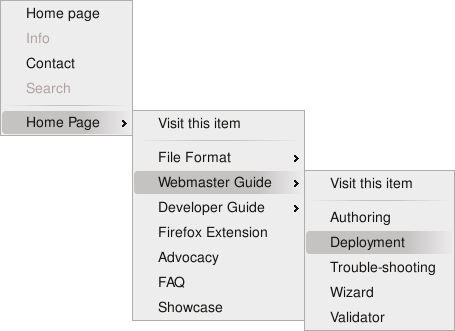 Then it can present the sitemap in a sidebar, or in a pop-up menu from your toolbar. The sitemap hierarchy appears as a collapsible tree in a sidebar which opens automatically when you visit a sitemap-enabled site. The roles home, contact and contentinfo are readily available in the navigation bar. The search role is supported by an integrated search field. If no site search mechanism is specified, a Google site search is used instead. The item in the sidebar matching the current page is marked with a target symbol . In case such an item is hidden, all its ancestors’ twisties are highlighted. You can also click the ‘Where am I?’ button at the foot of the sidebar, to find the item for the current page. This also works if the page appears at more than one place in the sitemap. All matching items are marked, their ancestors are highlighted, and the ‘Where am I?’ button cycles over all of them. The navigation toolbar can be configured horizontally or vertically. Not happy with the sitemap provided for a particular site? Close the sidebar, and it will stay closed, even when you return to the site. Some sitemaps need more horizontal space than others. The Navigator lets you alter the sidebar width, and remembers the position for when you return to the site later. Finally, if the sitemap has items in different languages, you can adjust your preference just for that sitemap. Standard-Sitemap Navigator respects your privacy by not permanently saving these settings during Private Browsing. The Navigator sidebar is distinct from Firefox’s native sidebar that shows bookmarks, history, error console, etc. The sidebar can be navigated just as well by keyboard. The Navigator provides a widget which you can place anywhere on your browser’s toolbars. It allows you to navigate a site with a space-saving pop-up menu. The roles home, contact, searchpage and contentinfo are available at the top level. Long ordered menus can be automatically subgrouped to make them easier to navigate. This uses the order attribute with a value of lexical. Preferences are available from the Add-ons window as usual for Firefox extensions, but you can also get them from the Options button at the bottom left of the sidebar. There are a variety of ways in which the sidebar hierarchy and the current page interact. As you move the cursor through the hierarchy, the current item is visited. When you click on an item, it opens up to show subitems, as well as visiting the page. If this option is not set, focus is transferred to the main content after a click. As you navigate in the page, the matching item is revealed, so all its parents are opened. As you navigate in the page, the matching item is revealed, so all its parents are opened, and it will be selected. As you navigate in the page, the matching item is revealed, so all its parents are opened, and it will be opened too. Role items like those above are normally not shown in the sidebar hierarchy, but are accessed from the role buttons on the toolbar. If you prefer, you can keep them in the hierarchy as well. When a sitemap contains a long list of items declared using the order attribute, the menu view will automatically group the items into several smaller groups, so the menu will not appear so long. This setting controls when this automatic grouping occurs. Lists no bigger than this setting are not automatically grouped. Normally when you click on a link in a page, the browser fetches the link while informing the server which page contained the link, i.e. who is the referrer. This usually appears in server logs, and webmasters might use the information to find out which other sites link to theirs. If you click on an item in the sidebar, the link is within the sitemap, so it could reasonably send the sitemap’s address as the referrer; or it could pretend that the link was in the current page. This setting gives you the choice. Note that the file format includes an attribute refer. From version 1.2 of the extension, this attribute is recognised, and can override your choice. This option should therefore be considered the default for when sitemaps do not specify anything themselves. Firefox will remember if you closed the sidebar for a sitemap you’ve already seen, but it will automatically open it for new sites. If you don’t want this, you can turn it off. When you visit a sitemap itself, it is also rendered in the sidebar, ignoring any other settings (like HTTP fields and HTML <link>s). 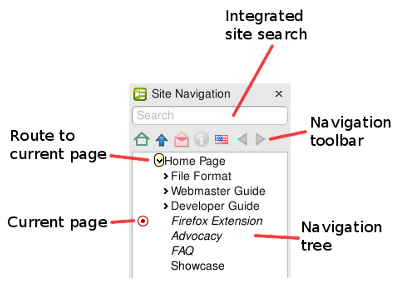 Buttons for displaying the sitemap source are available at the foot of the sidebar. The extension sends many detailed messages to the error console. What can I try the extension out on? Take a look at our showcases! Instead of a sidebar, could I have breadcrumbs? We would like the extension to support breadcrumbs, perhaps as a customizable toolbar widget. It is not yet implemented, but the software is designed to permit multiple renditions of a sitemap. Someone just needs to find the time to implement it. There is also the question of what to display if there are multiple paths in the sitemap to the current page. If you intend to develop the source code for the Firefox extension, you might find the source documentation helpful.